We are always here to answer questions and hear your concerns. please double check, your email is spelled correctly. 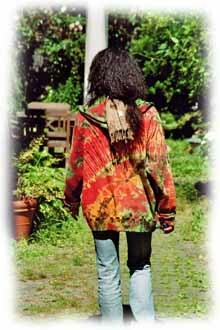 The site JustZen.com offers one of a kind tie dye items from skirts to henley shirts. Currently the favorite item are Unique Jackets for Women, Men and Juniors. This is not your standard spiral on the chest but wearable art instead. You can certainly vary the text if you like to express yourself more creatively. Then tell us in an email when you have this link up and where we can find it.